Fight season is here as we make our way back to the Alaska Airlines Center for our 15th season. 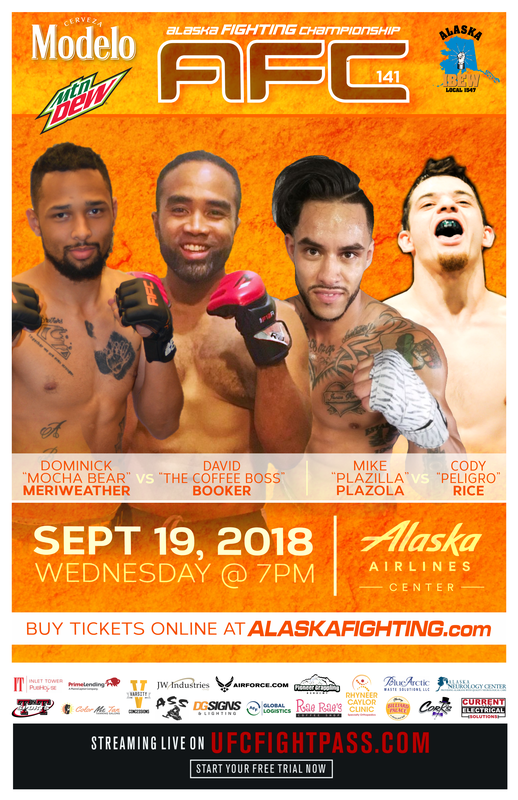 IBEW local 1547 & Modelo presents AFC 141 “Booker vs. Meriweather” Live MMA returns Wednesday, September 19th right on campus at the Alaska Airlines Center. David “The Coffee Boss” Booker takes on former teammate Dominic “Mocha Bear” Meriweather in this must see fight. Bring your friends and a grab a Modelo on draft at the Alaska Airlines Center for nonstop mixed martial arts action! AFC 141 – Wednesday, September 19th, LIVE at the Alaska Airlines Center. AFC is an all ages event and we offer free parking! Doors open at 6’oclock first fight at 7 ! Season ticket specials are still available! Get your tickets on line and check out the full fight card at alaskafighting.com! If you want to check out our upcoming events, go toour events page.